Black Sabbath, ten solo albums and one on the way (“Scream,” out this June), highly publicized drug and alcohol addiction, worldwide superstardom, and now an autobiography, “I Am Ozzy.” If you know anything about Ozzy and the life he has led up to this point, then you should know going into this read that you’re in for a wild ride. Be prepared to not put this book down for a while. “I Am Ozzy” chronicles the life and times, trials and tribulations of one John Michael “Ozzy” Osbourne, a humble kid who grew up in Birmingham, England. He was an ambitious (well, sort of) kid who made a choice in life early on – either work in a factory or blaze his own path. It was at that point that Ozzy would team with the likes of Geezer Butler, Tommy Iommi and Bill Ward in order to form Black Sabbath, and set out to change the course of music forever. Sabbath was unlike anyone had ever heard – it was new, it was dark and mysterious. The band spawned many things – thousands of imitators, millions of record sales worldwide and legions of fans, but for Ozzy it spawned something greater, something more life-altering – drug addition. Ozzy’s indulgence into drugs and alcohol led to his firing from Sabbath. He was replaced by then Rainbow frontman Ronnie James Dio. It was at that point that Ozzy also met the love of his life, current wife Sharon. But, in the end, Ozzy’s departure from Sabbath worked out for the best as he went to become one of the most popular, revered, successful and polarizing singers in music. Though Sabbath was now in the past, his drug addiction was certainly not. The book continues through his on-again, off-again (mostly on-again) bouts with addiction, the death of friend/guitarist Randy Rhodes, fights with Sharon, the birth of his five children, meeting President George Bush and the Queen of England, and behind the scenes of the hit reality show “the Osbournes.” Ozzy reveals he was out of it for most of the filming of the show. Throughout his life, he has been a living example of controversy. He bit the head off a bat, pissed on the Alamo and died twice, and that’s just skimming the surface. And to top things off in Ozzy fashion, the book ends on a somber note – Ozzy writing out what he thinks the epitaph on his tombstone will read like. 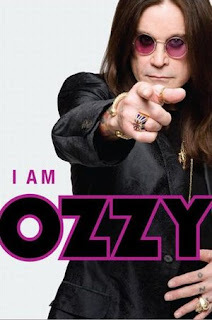 “I Am Ozzy” really delves deep into his life – past, present and future – and doesn’t leave many stones unturned. Most autobiographies are a PR stunt, but this one seems different – it’s far more honest and in-depth, characteristics that make this book a literal page-turner and a thoroughly resounding read. If you’re a Sabbath fan, or just an Ozzy fan, you should already own this book, and if you don’t yet, what are you waiting for? And also, kudos to you Chris Ayres, your work here could not have been easy cleaning up what Ozzy had to say.